Stockholm 2015: a trio of designers created this range of expanded metal and wooden furniture for Swedish company Blå Station with the intent that each successive owner will customise the pieces. Swedish designers Johan Lindau, Stefan Borselius and Thomas Bernstrand created the Honken collection for Blå Station with longevity in mind. The range comprises a table, a bench and a coffee table, as well as a generous armchair or cosy two-seater sofa. 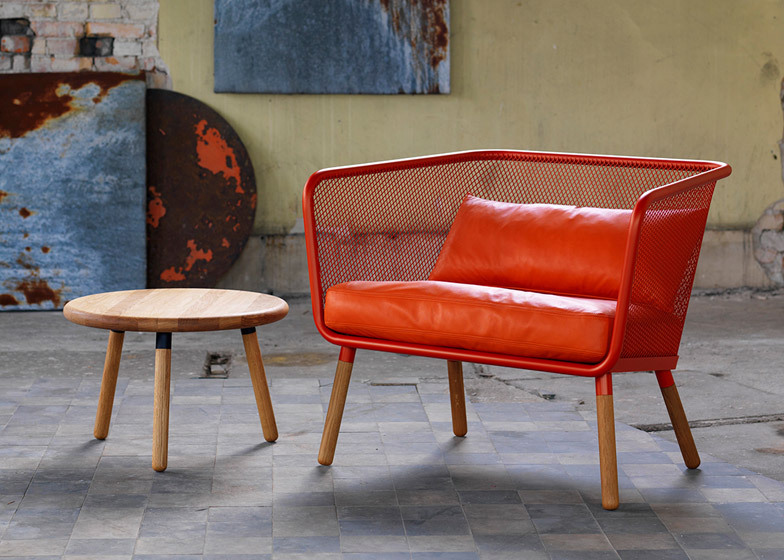 The Honken Armchair comprises an orange or black expanded metal "sitting basket" that is framed by a length of steel tubing. This 30-millimetre-diameter tube forms the seat's back and arm-rests, while the legs with rounded ends are turned from solid oak. Upholstered seat and back cushions are coloured to match the metal frame. The designers hope that when the chair's first users are finished with it, they will pass it on to someone else who will repaint the frame and reupholster the seat to give it a new life. As the chair was designed for Blå Station's Experiment 2015 project – where the aim was to create "classics of the future" – the collection is made to be durable. "Honken has been given all the conditions for living a very long life," said the brand in a statement. "Its frame is torsionally rigid and impact resistant and will survive even the toughest environments. And, when you give up, a new owner will take over, stretch out, put on a new coat of paint and sew new cushions." "I love products sold at flea markets and auctions, which people buy even though they are terribly scruffy," Bernstrand added. "Some pieces of furniture can be in very poor condition, but you buy them anyway, straighten them out, apply a new layer of varnish, make them a new cushion or polish them." "The result may not always be perfect, but that's not important, because these layers create a beautiful patina of history," he said. The Honken collection is completed with a table available with a round or oblong top and in two different heights – the lower of which is suitable for sitting on as a bench. The top and table legs are made from solid wood. Black or red lacquered steel fasteners connect the components, which are designed to be easily disassembled for easy transportation or storage. Honken was launched at the Stockholm Furniture Fair earlier this month, alongside the skinny Poppe chair created by the three designers as part of the same series.